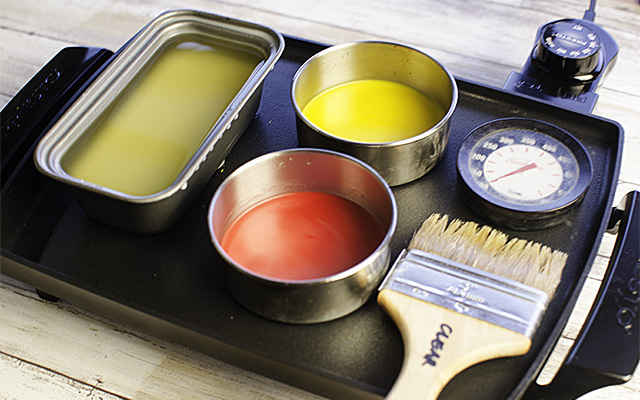 A heated palette is used to melt encaustic medium and paints and keep them in their molten state when painting. It is also used to warm brushes and other tools. An electric griddle is well-suited for this purpose. Choose one that has a smooth surface so you can melt and mix paint directly on the surface. The griddle I use has a large working surface area (19″ x 15”) which I love. It also has a raised plastic edge which makes a perfect brush holder preventing the handles from getting hot. You can buy the same griddle here. If you’re on a budget, you may want to check craigslist or your local thrift store for a used one. If you have limited space, this is a good alternative. With a working surface area of 10.5″ x 8.5”, it’s very compact and won’t use up too much space on your work table. This is particularly ideal if you’re only using encaustic medium or your color palette is limited to just 1 or 2 colors. Be careful with this one though. It doesn’t have a plastic edge at all so when you rest your brush on it, the handle does get hot. If you’re willing to spend a lot of money, R&F makes anodized aluminum hot plates designed specifically for encaustic use. 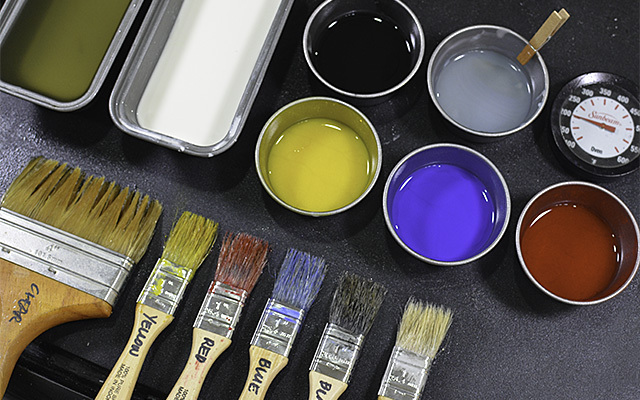 The neutral-colored surface allows you to see true colors when mixing paints directly on the palette (which is difficult to do on an electric griddle’s black surface). I’ve been considering buying the R&F hot plate but, in reality, I’m quite satisfied with my electric griddle. Presently, I can’t justify spending $300 on a 16×16 hot plate. Flat Thermometer – It’s important not to overheat the wax, so maintain your palette at a safe working temperature of 200°F and pair your griddle with a flat thermometer so you can accurately monitor the surface temperature. Paint Cups – You need paint cups to melt and hold the paints in. Any flat-bottom metal container will work, like muffin cups and mini loaf pans. Spring Metal Clamps – Use spring metal clamps with plastic handles to move your paint cups around and get them off the palette. Just be careful when you do this since these handles are sometimes unstable and may lead to spills. Electric Skillet – An electric skillet is handy for melting large volumes of encaustic medium and making your own medium. It is particularly useful when you’re working on large panels. You can buy the same one I use here. Again, you may want to check your local thrift store before buying a new one. Clip-on Thermometer – Always equip your electric skillet with a clip-on thermometer for accurate temperature control. Note: This video is from my YouTube channel and makes references to the YouTube user interface screen.